Over all these years, condition arrows have been an essential part of PES. Top Condition Arrows transforms normal players to superstars, while Poor Condition Arrow reduces your star players to ordinary men. In this post, you will find out how to achieve top condition for your team and maintain them. 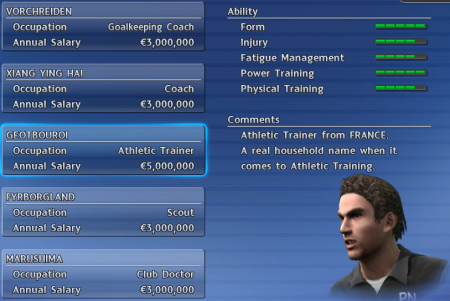 Team morale in PES has a direct impact on players’ condition arrow. Team morale is affected by the performance of your team. Good results and performance from your players will lead to an improvement in the condition arrow, while poor performance result in poor condition arrow. Thus, to improve on your players’ condition, you will have to put in good performances in your upcoming match. Once you achieved a victory, you will notice an improvement in the condition arrow after the match, especially for the goal scorers. Of course, to maintain the top condition, you just have to put in consistent performance. Playing a player in top condition give rise to better performance, which in turn maintains his top condition. Thus, always field players when they are on form. Another way to improve your team’s condition is through the hiring of a top level Athletic Trainer. Hire the best Athletic Trainer for the best result on your team’s condition. Let me know if these work for you! I’d like to know if a yellow or orange arrow improves the teamwork value of the player. Thanks! First off, great site! You’re posts are all very helpful. I have a question that is a bit off topic, but I’m not sure where a more appropriate place to ask would be so I’ve just added it to the latest post. I’m not sure whether you often play on the same team with other people, but my friend and I play every game this way, and have been since winning eleven 9! In PES 2011, we’re having some problems. Sometimes, the player that I control will suddenly be under his (my friend’s) control. We’ve tried changing the settings from “Assisted” to “Semi-assisted” and “Unassisted”, but still come upon this problem. Sometimes, we’ll both try to gain control of a player in front of goal when a cross is put in, and neither of us will be able to get control and the computer will end up taking the shot for us! That seems a little ridiculous to us, and it never happened in previous PES games. In past PES versions there is a numerical value for teamwork, however I cant seem to find it in PES 2011. Although there seemed to be no indication of an improvement in teamwork, good condition arrows will improve the stats of your players, making your players play better, and i think it doesnt matter the value of teamwork if your team is able to win matches.. What do you think? I understand your concerns, haha. I used to play 2 players in the same team a fews year back, but not now anymore. However, this problem exists in 1-player mode too! There have been cases when I am unable to gain control of players, and the computer will take a shot for me, as well as clear loose balls on my behalf. This looks really absurd. Guess this is just Konami’s way of ‘assisting’ us. When you face difficulties selecting the players you intended, perhaps you can try holding your directional button in that direction before pressing the switch player control. I use this often, and although its not perfect, I usually get the player I want. What do you think? Well, the teamwork value it’s in the stats of every player. In Master League when you buy a player during a season his matchs ratings are very bad (bad passes, bad tackles, no shots on goal,…) because he has not gelled well with the other members of the team, and all independently of the color of his arrow. I think a orange arrow makes the player better in his indiviual skills but if his teamwork value is low he can’t make a full use of those increased skills in the field with his team. So I prefer to choose a regular first eleven player with an blue arrow rather than a new player with an orange arrow and a teamwork value of 23. In my opinion these players make good substitutions if you’re winning in the lasts minutes of the match. Thanks for your site Zed! I didnt really notice that. Many thanks for sharing! Great Articles for the Pro Purist, good work! Please please look into the Skill Card assignments, what have they DONE? 90+ weeks to learn how to long throw?!?!? All those years when a new PES is out the first thing I do is to create new players (for the Greek league or other leagues in Europe) that were aquired late in the summer transfer period. So I created them again with PES2011. But when it comes to Master League all these players are always with the worst condition arrow and their card says that they have a bad relation with the club. On the one player I even let him go to some other team for a year and then bought him back. He played one(only one-the first)game with normal condition and then onwards the condition is the worst. Anyone know what can I do? I’m not much of a gamer anymore, but back in the day me and my mate used to play on the same team – with a controller each – and play master league and all the cup comps. We recently decided to re-live our youth and bought PES 2011 for the Wii. It doesn’t seem to be able to allow us to play on the same team anymore. It does in a standard one off game but not in any of the competitions. Is there something we are doing wrong? or are you not alloowed to do this anymore? If so, what is the most recent edition that will allow? or should we change formats? I have a PS2…. can you help please. Thanks. Thanks for you question. I am sorry for not being able to assist as I do not play on Wii. Perhaps any readers can assist on this? I have been reading on your website to help me on my pes 2011 pc. It has been a great help. May I know how I can gain access to your special category and also getting the pes mastery guide. I have registered for more than a week but yet to receive any news. Thanks for finding my site useful! I m sorry for the delay, you should have received the password by now! Let me know if you have not. b) some players seem to be on better form than others, especially when playing a 2P exhibition. For example, last night, I played a ML game with Arsenal – Chamakh had a red “form arrow” & Bendtner was green (& an unused sub). I score a hat trick with Chamakh – yet for the next game Bendtner was yellow & Chamakh blue! Yes the form will be random for an exhibition. However for ML i believe we have some sort of control over the colours of the arrow. You can do so in Master League, under Youth Team. 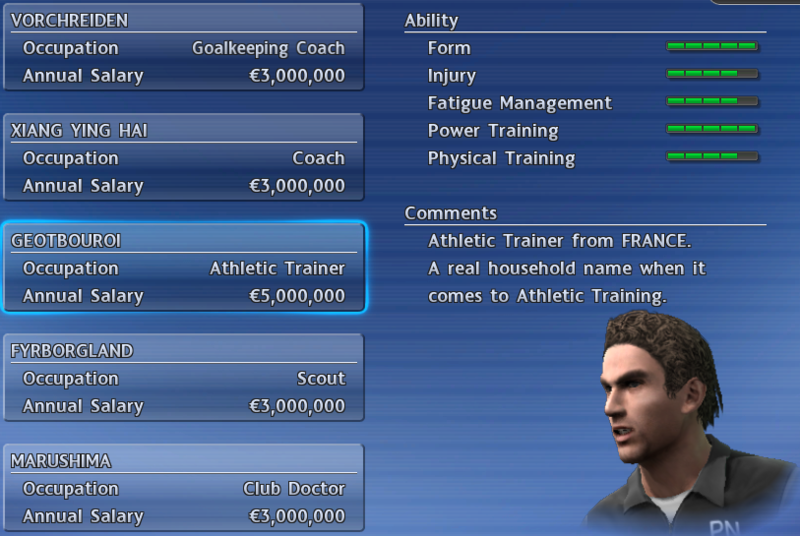 Simply select the youth player you wish and sign and offer him a contract! And he wants to leave what can I do? I apologise as I have not encountered this situation. Does anyone happen to know how to resolve this? even win everything, cond arrow still not good..
opponents arrow always red even bottom of the league or lose.. Guess PES 2011 isn’t to your liking. Lets hope PES 2012 will be better for you! So me and my friend constantly play exhibition one on one matches and I always take the second controller. Yes, I beat him all the time. I was wondering if his form arrows for all players has gone down to purple for the same reason. From his controller all are purple while mine range from green to red. Will letting him win consecutive times improve his ratings.. I think you have set the options for condition to random. in master league i have player his arrow always purple even he play all matches .. why? Hi all, I have encountered exactly the same problem with creating players & acquiring them for my master league team!! I have done a little bit of research & it appears that this is a ‘glitch’ in the game!! The only real solution at the moment is to edit a player that is already in the game, rather than creating your player from scratch!! Hope this helps!! PS. I hope that Konami sort this out for the 2012 version!! Hi, I’m playing ML, PES 2011 and want to know how I can change my trainers? Where and when? pes 12 is very good. I like it!! formation 4-2-1-3 attack so strong. oh you can only change them during the off season.